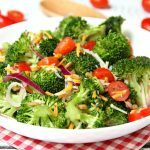 Broccoli and Tomato Salad – Sweet grape tomatoes, red onion, broccoli, cheese and sunflower seeds drizzled with a tangy raspberry vinaigrette. I am ALL about picnic and potluck food this month! We’ve been entertaining a lot this summer already and although I have several go-to recipes like this pea salad (which I make A LOT), I always like to do my best to switch things up a bit and keep my menus exciting and fresh. I tend to make a lot of cold salads with broccoli. 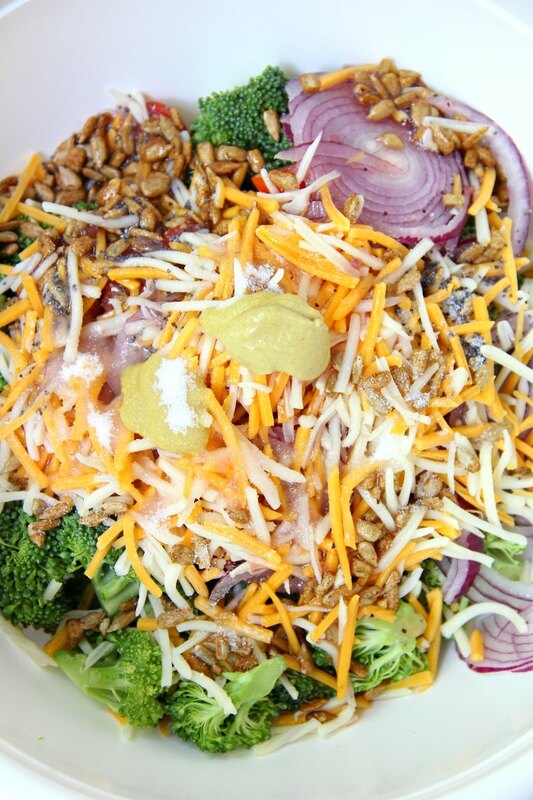 Two of my favorites are this cranberry almond salad and this cheddar broccoli salad. Yum! That being said, the broccoli and tomato salad recipe I’m sharing today is right up there alongside the others. Besides being flavorful and delicious, it’s really quite pretty and colorful, too! I had some sweet grape tomatoes that I needed to use up, and I knew that this salad was where they belonged! It takes just minutes to get all of the ingredients into a bowl. Then, all you do is mix. . .and wait. This is the most difficult part. You really do want to let the ingredients meld in the fridge for at least five hours. Overnight is always best. I don’t know about you, but I love salads like this. If I can throw something together the night before, so it’s ready the next day when I need it, I’m all over it. And I’m all about a little prep work the night before to make “party day” a bit less stressful. Amen? Amen. I feel like people are drawn to this salad because of the color and the freshness. And once they taste it, they’re back in line for seconds. 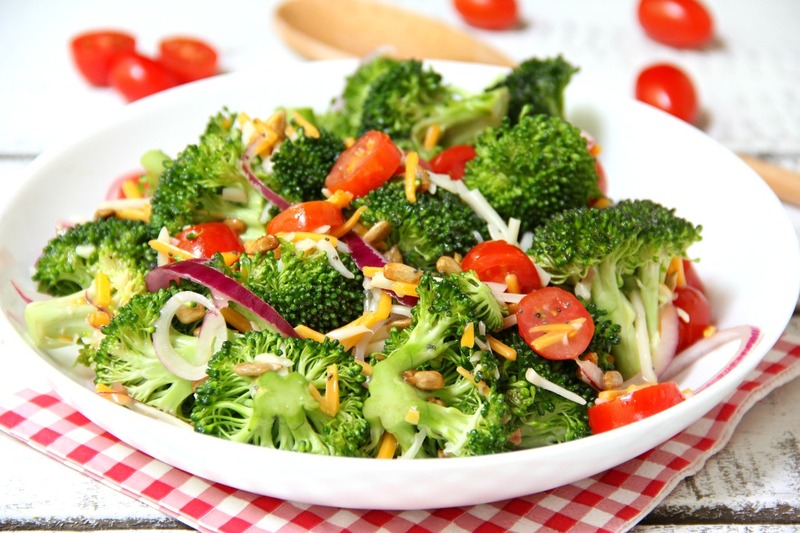 I can’t wait to hear how you and your guests enjoy this broccoli and tomato salad! 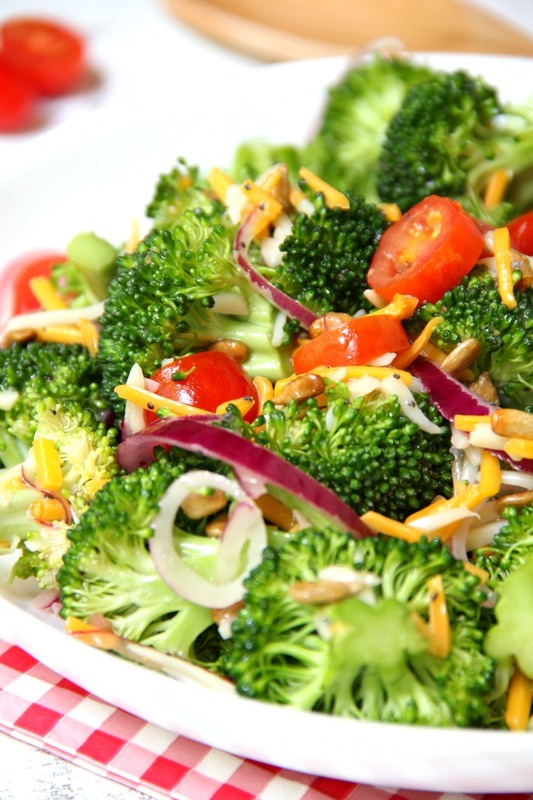 Sweet grape tomatoes, red onion, broccoli, cheese and sunflower seeds drizzled with a tangy raspberry vinaigrette. 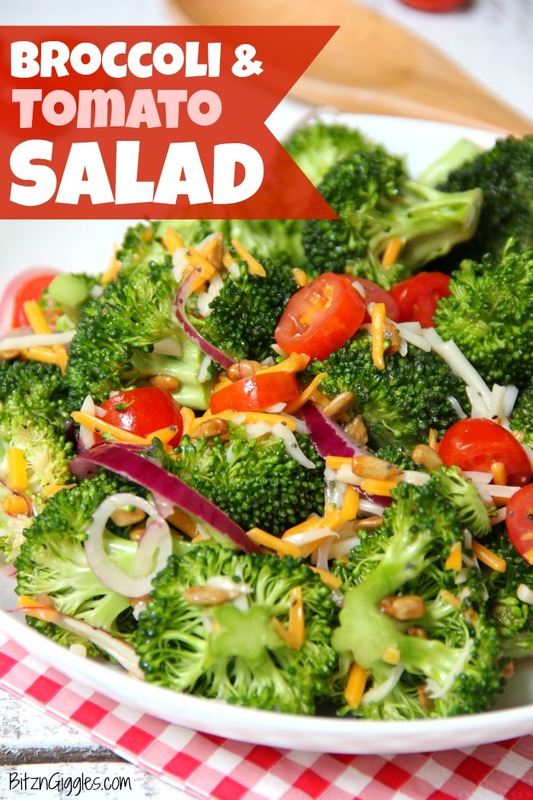 Combine broccoli, tomatoes, cheese, onions and sunflower kernels in a large bowl. Add the salad dressing, mustard, sugar and poppy seeds. 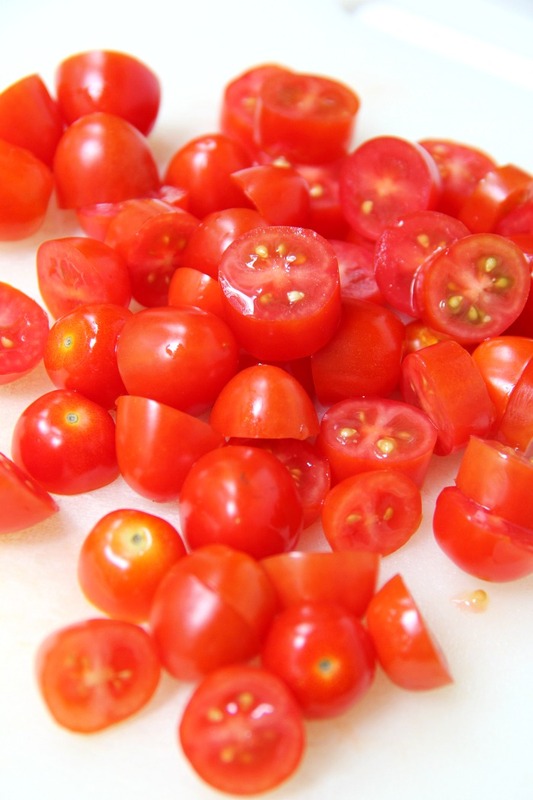 Refrigerate at least 5 hours or overnight.